If you are interested in traveling abroad without paying any agent for the visa, ticket, and accommodation? Then you are at the right place. 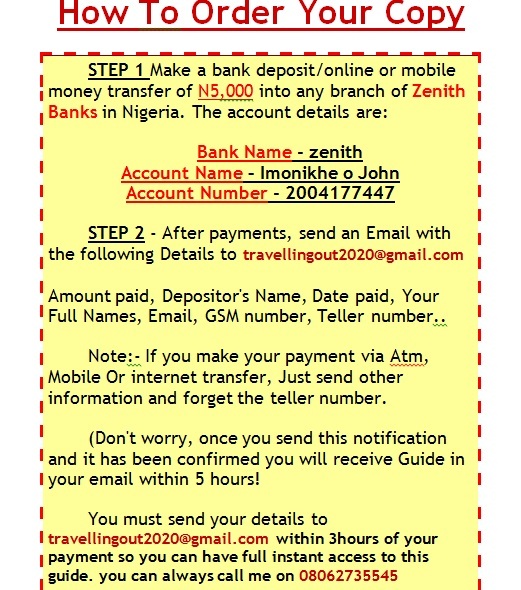 Today right now on this page and with your permission, I want to reveal to you my recent discovery of how I have been able to travel and send so many people to abroad without spending too much money. If you don’t have time to read all the chapters of this eBook pick the chapter that fit your situation read and implement it, when it works for you read other chapters and implement it for other people who are eager to travel abroad. The information I have recently discovered is unique and will change your life forever. At This Point! 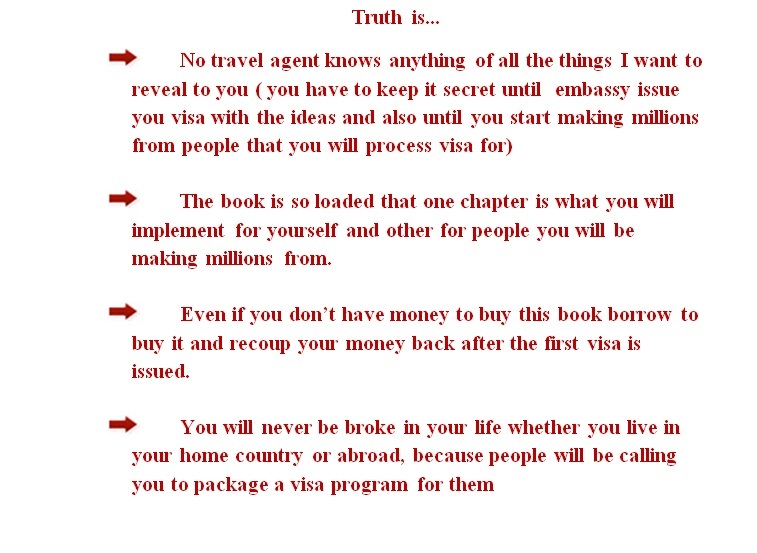 I would like to introduce to you the secrets on how to compel Embassies to issue your visa with no agent required. Here I have created A Complete Step By Step Easy to follow on How anyone anywhere Can Go to any country in the world without consulting an agent or spending much money. 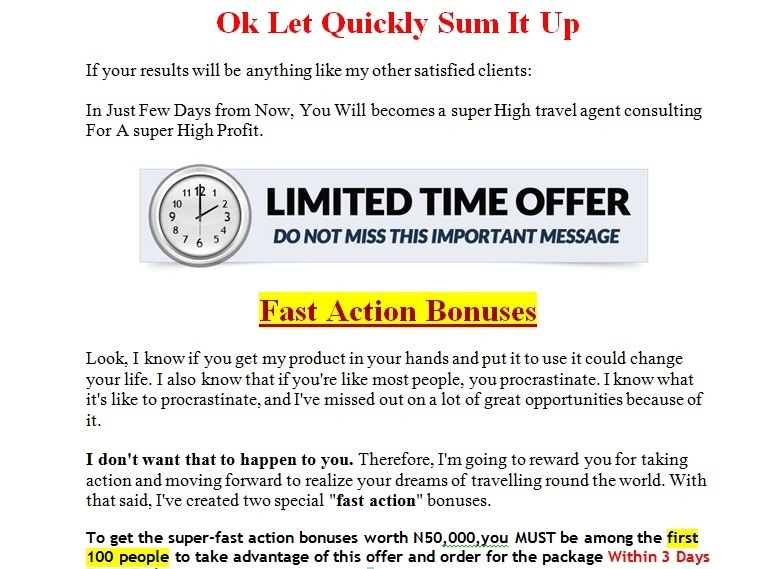 How to kick-start your own travel consultant business 72 hours from now and make big cash monthly. I’m talking about an average of N500k to N1M monthly here. 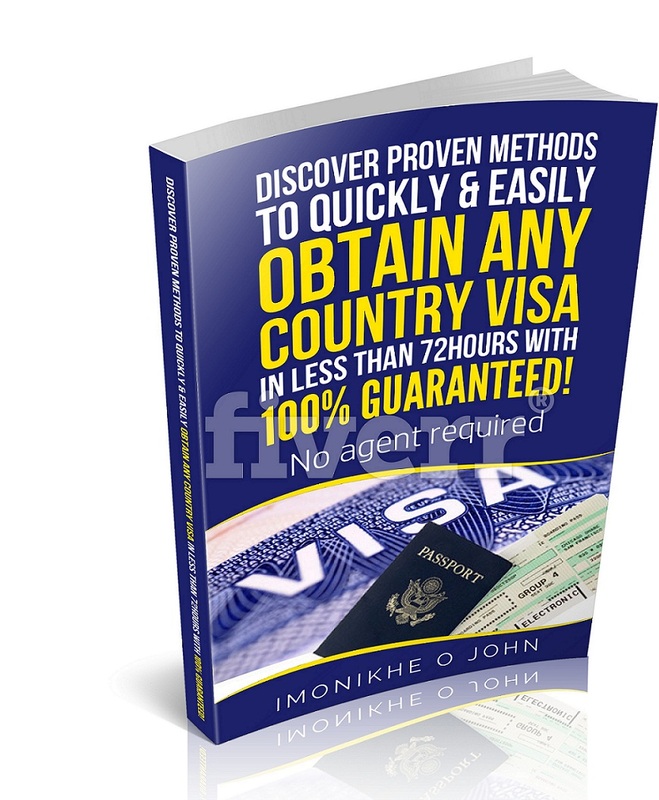 Take You By Hand and Reveal to You All I Know About free visa programs and other possible ways to travel abroad. The Full Contact Details Of This Companies, Their Website, and Contact Number, Plus Full Details On How to approach them with a good motivational letter or cover letter. Am Going to Download All I know About travel Business Into Your Brain and let you have access to this first-hand information before anyone else. It’s no exaggeration to say that – once you’ve mastered travel consultancy in this book – the income boost can be life-changing. 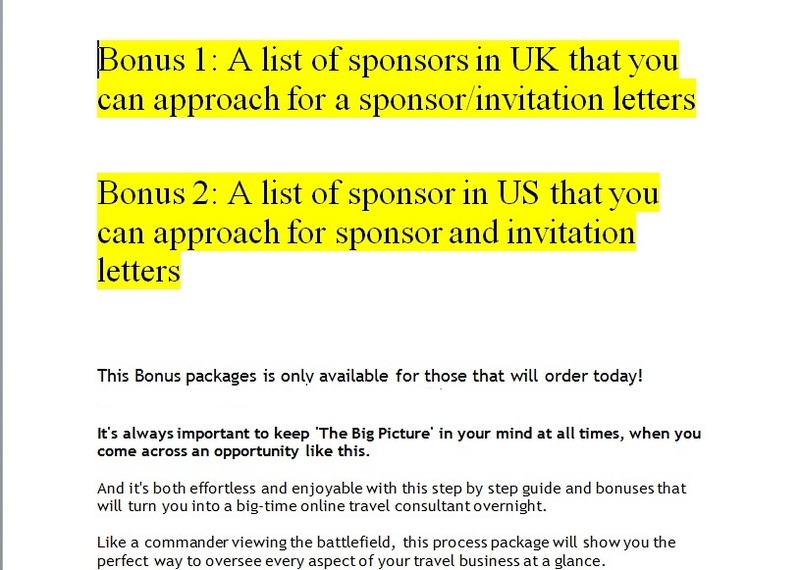 So what will you do with your new found online travel consultant business? Perhaps you’ll shock your haters the amount of cash you are controlling? And how about savoring the look of astonishment on the face of your friends when you show off with new visa and tell them you are traveling to US or UK? Because that’s the sort of true financial freedom you can look forward to once my Visa travel Guide secrets are YOUR secrets. … so I’m taking all the risk from you. Before I tell you, let me point out some facts you may already know to you. You’ll be learning first hand from a respected travel agent consultant of 7 years experience in the travel Business World. I will personally make sure you succeed with your travel business. Believe me! People charge as high as N200,000 to N350,000 just to issue ordinary Dubai visa let alone a US OR UK visa.so just pick your calculator and see how much you will be making if you do one US or UK visa. … because I retain the ABSOLUTE RIGHT to INCREASE the price once THE FIRST 1000 people order their own. In fact, it’s probably happening as you are reading this. FAIR WARNING: It’s only when you are among the first 100 people to order your copy of the visa guild report within 5 Days From Today before you will be entitled to the BONUSES. … continue down the road of agonizing trial and error, wondering if you’ll EVER fully understand how to arrange your travel by yourself and do it for others. …the information that will be presented in the guide can help you kick start your travel business with little or no capital. 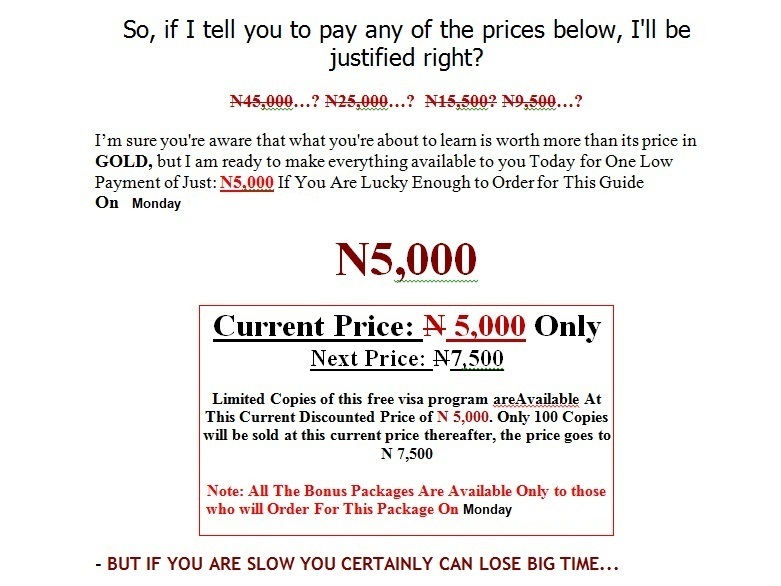 NOTE:- Its only when you order for this travel guide TODAY That you will be entitled to all the bonus packages! so seize this opportunity and make a change in your life. I look forward to hearing about your success with your travel sojourn. Even though I get an enormous amount of mails, please write to me. I’d love to hear your success story! Start travelling around the world today!